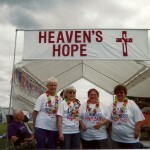 I have walked with the Bethany Baptist team (Team name Heaven’s Hope) for over 10 years. The event kicks off with the Survivors’ Lap (5PM on Friday) where all cancer survivors-and family members-walk one lap around the track. After the Survivors’ Lap, team members walk the track from 6PM Friday-6PM Saturday. 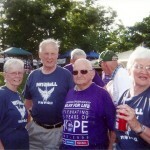 Our cousins, Sherry, Carol and Martha also take part in this fund-raising walk. 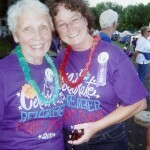 (Sherry and I have the 6AM-7AM slot on Saturday AM—but we walk many of the other hours also. I’m always there from late Friday afternoon until around 10 PM and then back for the 6AM walk. On Friday evening, there is a silent luminary walk—where candles, each in honor of or in memory of a loved one, line the track. ($5 for each candle is part of the fund-raising; Chris has had a candle lit with the name ‘Swanson Family’ each year). Those in our family who have fought cancer and who have walked in this relay include Ed, Phil, Joan, Ingrid, Marjorie, Mitchell. Other family members attend and we typically set up chairs together to sit and chat in between walks on the track. Look for ‘Heaven’s Hope’ site in the middle of the track—big sign! If anyone would like to sponsor me, please use the Contact Form and include your name and phone number so we can get back to you. ($$ is due before June 7th). 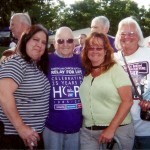 Checks should be made out to American Cancer Society with Gardner MA Relay added to the memo line. As an added note, this is the 20th Gardner MA Relay for Life and we always come in #1 in New England—and in the top 5-10 in the country! Last year we raised over $700,000 to fight this terrible disease that so greatly affects our family. $800,000 is the target this year! Thank you so much for your support and I hope to see you there! The Gallery below is from previous years. 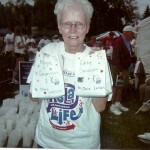 This entry was posted in Christine and tagged Gardner, Relay For Life by Gary. Bookmark the permalink. I have contacted Chris and asked her to attempt to contact you with this information.